Food from Northern Argentina offers visitors a glimpse into Andean gastronomical tradition, as well as a rare chance to taste spicy food. Referred to in Spanish as comida norteña or comida autóctona, it comes from the region around Tucumán, and extends northward toward Bolivia. 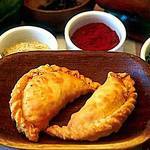 The staple of the cuisine, famous and ubiquitous throughout the country, is the empanada, but the tamal, locro, and humitas are all prominently featured in the cuisine as well. These Northern provinces hug the border of the Andes, and still maintain relatively strong indigenous traditions. Foods from these regions wholly incorporate crops that have been harvested for thousands of years; principally, corn, potatoes, chilies, tomatoes, quinoa, and pumpkin. Visitors from North America will likely recognize and be familiar with many of these names and general dishes; American indigenous traditions extended through the two continents and have influenced modern Mexican food. While we highly recommend the visit, you do not have to travel to the north of Argentina to savor these delicacies- there is a plethora of restaurantes autóctonos throughout the city, and they are generally less expensive than the average porteña eatery. Indeed, there is an empanada store everywhere you turn in Buenos Aires, and these little treats can fill up your stomach for just a handful of change. This page rendered in 0.825 seconds.